Getting employees to buy into plans and engaged in their work sounds easy, but it is harder than you might think. Just being satisfied with your job is not enough. So how do you do it? Managers that I am coaching ask me on a regular basis, how can I get people to buy into my plans and what our business is trying to achieve? Although the manager is a large part of the answer, it is also to necessary to look at the organisation’s culture, structure and systems as often these can work against employee engagement albeit unwittingly. In recent years, there has been a weight of evidence suggesting that engagement has a significant impact on productivity and performance. The enlightened organisations also appreciate the impact on individual wellbeing, absenteeism, presenteesim and labour turnover. One of the few books that tries hard to bring together, psychological and critical HRM perspectives on engagement as well as their practical application is worth reading if you are looking to improve your employee engagement. 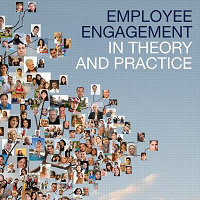 Employee Engagement in Theory and Practice explores a range of concepts and core themes both from a research perspective and from a practical business perspective. It includes several interesting and highly relevant case studies, some of which are co-authored by practitioners. I believe this book will appeal to students studying at both undergraduate and postgraduate levels, as well as practitioners interested in finding out more about the theoretical underpinnings of engagement alongside its practical application. My main concern is that you should not read this book seeking simple answers as true employee engagement requires a commitment to a long term cultural shift in the mindset of managers and probably significant modifications to systems, processes and organisational behaviours which usually take longer than managers think.